If you live in Key West, it should be on your coffee table. If you are coming to Key West, it should be a carry-on companion. 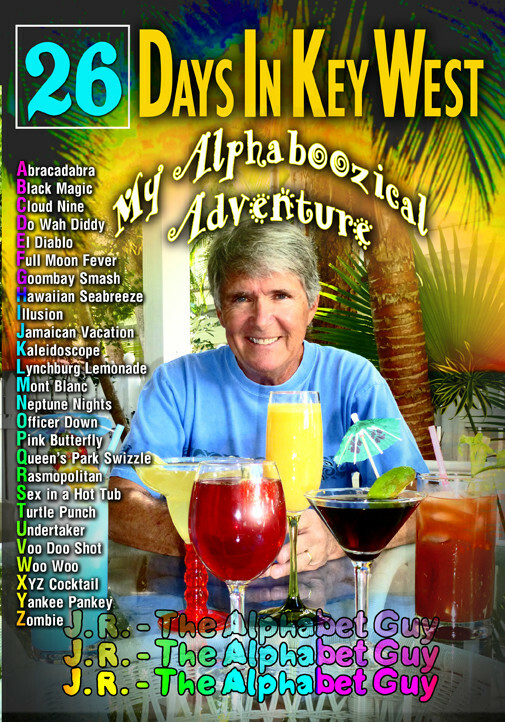 26 Days in Key West, My Alphaboozical Adventure offers a fun filled look at Key West history and dining while doubling as a drinking guide, with a unique twist. Follow the alphabet guy around Key West on his quest to drink a different drink, in alpha order, at a different location every day for 26 days. Or plan a quest of your own, using his guide as your roadmap. “On January 10th of 2010, I was reading a newspaper article about New Year’s resolutions. The main point of the article was that if you were reading the article on January 10th, you had most likely broken any resolutions you had set for yourself. I concurred with the premise as I had already skipped three days of exercise and had downed close to a half gallon of ice cream. Pre-Order your copy today at this special publisher's discount of $14.99, regularly $24.99. Also available as an ebook on the Amazon Kindle, iPad, iPhone, Nook, Sony ereader Get yours today!